A unique sculpture designed to add beauty and charm to the home or garden. These bells are not powered by the wind; they are people and animal powered! 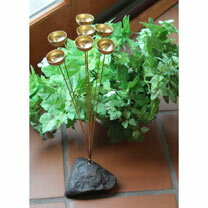 Put birdseed in the bell cups - the action of the birds makes the bells move and ring. Or place the bells close to a walkway so people walking by brush up against the bells and make them ring. Your guests won't be able to resist announcing their arrival that way! 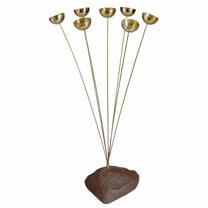 Seven polished brass bells, overall height 50cm.